The current revival of the tango spread with blazing intensity, thanks to the globalization of communications. It started to rise around 1990, after 30 years of no major tango activity, with the unexpected success of a musical revue aptly named Tango Argentino. Producers Claudio Segovia and Héctor Orezzoli synthesized all the implicit dramatic qualities of the tango on the stage. They focused on the taciturn man of Buenos Aires (who is secretly idealistic with a devastating sense of humor) and the seductive Buenos Aires woman (who is alluring and drop-dead elegant). But it was the performance of the dancing couples that captivated the public’s imagination, reintroducing a dance in which the man flaunted his masculinity and the couples embraced each other in a sensual ritual full of irresistible beauty. This week, 30 years ago, Tango Argentino appeared for the first time on an international stage at the Paris Autumn Festival, which began on November 11, 1983. That run lasted one week, but those few days were enough to change history: the tango as dance resurfaced with an unexpected force, and became huge around the world. There has never been a time in history when so many social dancers are dancing Argentine tango as it was danced in the golden years of the 1940s and ’50s. Mental health is a serious issue that doesn’t get the necessary attention it deserves. Occasionally somebody goes way over the edge and tragedy ensues. Like the absurd killing in her sleep of a tango dancer and Pilates instructor by her disturbed husband who committed suicide, leaving the proverbial question of why it happened, unanswered. A few days earlier the woman had written a foreboding poem on her Facebook page. A social media site like Facebook,where people are in daily contact with a lot of “friends in name only (FINO)” most of whom have never met, is not the place to be abusive of ex-spouses, or to air dirty linen in public. Unruly children, regardless of biological age, are bound to run into parents everywhere. The world of tango is not excluded. Lack of tact and propriety in venting family or personal feuds in public are good enough reasons sometimes for an adult wanting to intervene. People may feel the need to be very sorry for this person. Personally I had no love nor hate available for her. I saw a dangerous person capable of a different kind of harm, as she continued. And that my friends, is how psychotic and hysterical words that have been repeated so many times in high school bathrooms all over the land, make their way into our sacred adult tango world. And that’s how character assassination begins. 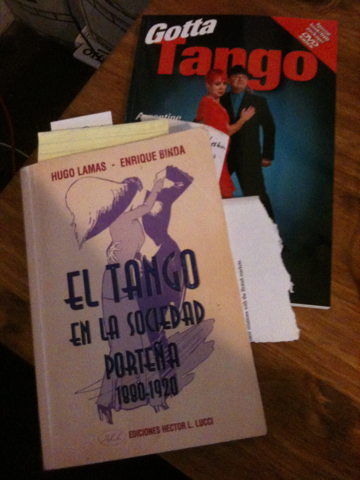 I couldn’t believe my eyes when I read the announcement of the second launch of Hugo Lamas and Enrique Binda's book "Tango in the Buenos Aires society, 1880 -1920.” Actually it said “El Tango en la Sociedad Porteña, 1880-1920” because the book is written in Spanish, which may have been the reason why Mr. Farris Thompson left it out of his profuse bibliography in his fairy tale book about the way the tango was stolen from the black population in mid nineteenth century Buenos Aires. The book was first published on November 1, 1998 and it almost immediately disappeared from the book shelves. Hugo Lamas is the pseudonym of Hugo Alberto Vainikoff. He was a teacher and a historical researcher. With his wife, Julia Navarro and a group of friends founded in 1970 the magazine “Tango Buenos Aires.” He passed away in 1999, one year after the book’s first publication. 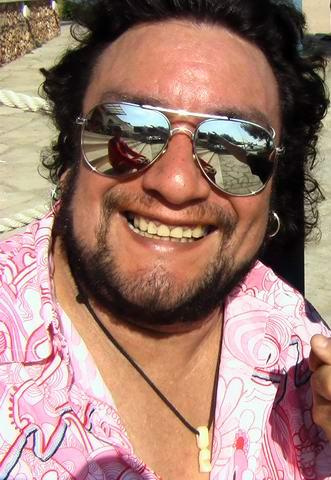 Norberto Enrique Binda (1946) is a civil engineer but is strongly associated with the tango. He’s a collector of original 78 rpm records prior to 1935, a researcher and a historian. He has contributed articles in various publications and Internet forums on the subject. Since 1970 he is Member of the National Academy of Tango and its Board of Directors. We became aware of the book during our Katrina exile in Buenos Aires in 2005 reading old issues of B.A. Tango. In one editorial Tito Palumbo had written about the book and predicted how it was going to shake up the tango establishment bringing down many statues built with mud pedestals. The expression conveys its message of exposing false prophets and snake oil salesmen better in the original jargon. When Katrina hit New Orleans on August 29, 2005, we were teaching in Tallahassee,FL and ended up teaching our way around the country and finally in Buenos Aires for four months before we could return to find out what was left of our lives. The aftermath of the hurricane, the breaching of the levees, and the flooding of the city altered the plans we had to shoot the video for the DVD of our book Gotta Tango. We’ve always found great fortune in knowing people in low places, so after verifying the no availability of the book, we called on upon some people who called some people who asked us to meet some people at an apartment on Calle Parana. I still feel the tingling that I experienced when I found a single copy buried deep in the bottom of a shelf. That night I didn’t sleep pouring over the pages of a very complicated book to read because of its plain narrative style. The authors use verbal language, almost conversational, presenting documentation and researching their parts in the most exhaustive way. In developing the work related to the central theme emerge sociological, theatrical, literary, musical, biographical, aesthetic, and testimonial connotations, revealing of that time. They write that in tango circles there is a need to clarify confusing aspects and periods, particularly prior to the nineteen twenties. But since to do that requires laborious work nobody wants to do the required investigation, at least seriously. The existing literature does not answer to any aspect of the matter, and it is not based on verifiable documentation. It pretends to teach about unlikely events, repeated at will by the authors because of a lack of rigorous and methodical investigation of the subject matter. That is what we had done in the first three chapters of our manuscript. Like everyone else who has written about tango in the last fifteen years, we had repeated like fairground parrots the same old cliches, tall tales, and exotic lies that has percolated around the tango lore. What Katrina did to New Orleans and our four months in exile played a fundamental role in the way our book went through an epiphany of sorts. We had to start all over again, we decided. Our publisher agreed grudgingly, and the rewrite of Gotta Tango began in earnest. When Gotta Tango finally was released for publication in November of 2007, we were very proud of being the first ones to have written about tango history with honesty, accuracy, and verifiable information. We acknowledged our deepest gratitude and respect to Hugo Lamas and Enrique Binda for their formidable and well-researched book El Tango en la Sociedad Porteña, which put within our reach a verifiable and contemporary documentation that narrates a period of the history of tango from 1880 to 1920 where bibliography did not exist before. As another anniversary of Katrina approaches, we count our blessings for the many things that have guided our destinies, thank the thousand of anonymous readers of our book, and join the celebration of the Lamas and Binda families for having gotten a second chance to set people free with the truth.